Listen to the podcast. Find it on iTunes/iPod and Podcast.com. Read a full transcript or download a copy. Sponsor: The Open Group. We've assembled a distinguished panel in conjunction with the recent Open Group Conference in Austin, Texas, to explore the impact, role and opportunity for business architecture. We'll examine how the definition of business architect has matured, and we'll see why it’s so important for this new role to flourish in today’s dynamic business and IT landscapes. We'll also see how certification and training are helping to shape the business architecture leaders of tomorrow. Here to help better understand the essential impact of business architecture on business success is Harry Hendrickx, the Chief Technology Officer, CME Industry Unit, HP Enterprise Services and a Certified Global Enterprise Architect; Dave van Gelder, Global Architect in the Financial Services Strategic Business Unit at Capgemini; Mieke Mahakena, Label Leader for Architecture in the Training Portfolio at Capgemini Academy and also a Certified Architect; Peter Haviland, head of Architecture Services in the Americas for Ernst & Young, and Kevin Daley, Chief Architect in the Technology and Innovation Group at IBM Global Business Services. Gardner: We see that CEOs around the world really are seeking fundamental change from IT. They recognize that we're at an inflection point. Why then is the role of business architect so important now? Hendrickx: Over the past one or two decades, business-IT alignment has been number one on the CIO agenda, and apparently the organizations have increasing difficulty getting bus iness-IT alignment resolved. There are quite a few people pioneering in business-IT alignment, but apparently there was no urgency yet to recognize this role more specifically. HP, in the past two years, interviewed CIOs worldwide, and they all indicated that they face quite large and complex transformation processes. They also recognize that business-IT alignment is one of key issues. We think that the business architect really can provide some resolution to get those processes in better shape and more successful. Daley: At IBM, we have a CEO study and a CIO study that come out in alternating years. One of the things that started coming out loud and clear in 2010 was that managing complexity and building operating dexterity required a better understanding across the entire company. We've started seeing a trend to move not just from business IT alignment, but to business and IT convergence. There's an understanding more and more that information technology, and technology in general, is a core part of the business model now. There's an understanding that now we have a situation where business and IT aren’t so much aligned, because of the fact that IT is part of business. Where we did interviews and surveys and then compiled them for thousands of CEOs, we came up with three key elements. Amongst those was managing and taking advantage of complexity while building operating dexterity. That’s the key theme. One of the problems that we're seeing from the CEOs is having for decades separated IT as if it was its own business unit, instead of part of the true sense of the business. It's been an interpretive science. To manage that complexity they needed a means by which to start with the design of where they're going and have have a business strategy. To manage that complexity they needed a means by which to start with the design of where they're going and have have a business strategy. How do they take that strategy and transform it into technology and into information management? They needed an ability to have a framework in which to have that substantive discussion between the people who were responsible, such as the CIO who is responsible for technology and the operations and the COOs, who are really about the execution of the overall picture. What we've seen from our CEOs is a need to start being more integrated. There have been market pressures that they having to respond to. The big economic downturn was a big change for everyone, and they are trying to address it. They're looking at means that they can start integrating more globally. They can start to increase their cost variability and start becoming more agile in how they operate their business. To do that they need a means by which they can more effectively communicate. So far, we've been seeing that business architecture is a perfect way to start driving an understanding. It's a place where both people who are used to seeing standard business models like revenue and capability are able to associate that to the different types of architectures and designs that we see coming out of the technology group. It's giving them a common place to meet and jointly move forward with what they're trying to do in terms of managing the complexity, so they can be more agile and dexterous. Gardner: What are the stakes here for business architecture and for organizations that can master this? How important is this now? Haviland: It’s extremely important. What I see is that this is a discipline that’s just crying out for more people and more maturity. You almost need it to become pervasive throughout organizations now. The most common story I encounter is simply that organizations spent a lot of time in the past creating their processes and then they spent a lot of time feeding technology solutions to those processes. In recent times, the pace of technology change has moved faster than that previous paradigm. What you're looking at is at people saying, well, I am the business, there are all of these technology options out there. I cannot find a way forward and so how do I exploit those? That is where the business architecture profession is really being pushed to the front. That said, there is a slight risk here that it may be considered too much in isolation. I mean, it is an architecture profession, it is a part of architecture, and the value of architecture is to provide that aligned view across the various domains that are important in terms of business, technology, information, security, and those types of elements. When it comes back to what’s at stake for businesses that are investing in this particular area and for businesses that are trying to reconsider the way that they can operate themselves to support technology, they are moving ahead and they have competitive advantage. Businesses that aren’t doing that tend to be left behind, because the pace of change of technology is going to get faster. Gardner: Does a business architect and architecture have to be at a high level to be successful? Where in the org chart do we typically see this role? Is it near the top? Does it matter? van Gelder: It depends on the maturity of an organization. Within Capgemini nowadays, we talk about business technology. As Kevin said, business and technology are not separate. Technology is part of the total business. When we started the Business Architecture Working Group in 2006, there was a lot of discussion about two words, business and architecture, and nobody knew exactly what we were talking about. Everybody had a different understanding of those words. In the last years what you have seen is that business architecture is looked at in a different way. Currently in the Business Architecture Working Group, we see business architecture as something that brings the balance between all the other architectures in the company -- that’s IT architecture, financial architecture, money, people architecture, and a lot of other architectures. If business architecture is bringing the balance between the different aspects of a company, then business architecture is something that should be handled in the top of the organization, because balance should be created between all the different aspects in the organization. Gardner: What then is the fundamental problem that the business architect needs to solve? Mahakena: It's more like making sure that, whatever transformation you're going to implement, you align all those different aspects. As Dave told us, there are a number of aspects in an organization that might need to change, and you can have all those different architectures for those aspects. But, if every aspect goes its own way in changing, then they will never be aligned. Business architecture is meant to align all of those aspects to make sure that you have a balanced, consistent, and coherent set of operations at the end. Gardner: It sounds as if we're in agreement that this is a high level function, but what is it that people might stumble upon, if they direct this in a wrong direction? What is business architecture not good at? Haviland: Business architecture is similar to other forms of architecture, in that it tends to try to do many things all at once. The idea of enterprise alignment is definitely the right outcome, but there is enough complexity there to blow steam out of your head for many, many years to come. Certainly in our experience in implementing these types of functions in organizations, functions that constrain scope very well, also tend to communicate very well around what their status is, what their progress is against milestones, and what outcomes they've achieved, and they tend to articulate those outcomes in terms of real business value. What business architecture is not very good at are broad-reaching types of goals that don’t have measurable outcomes. Gardner: Anyone could stand up and call themselves a business architect, but what is The Open Group, in particular, doing about actually certifying and moving toward a standardization of some sort? Hendrickx: The first question we get asked is, what's the difference between a business consultant and a business architect or a business analyst and a business architect? We also have enterprise architect and technology architects. Is there a reason for being for the business architect? This is something we did a lot of research on at HP and we delineated the role of the business architect quite clearly from the business consulting and the business analyst aspect. The business architect's role is distinct, because he combines the organizational strategy with the operations. He identifies the implications of this strategy, as well as that of the technology for the business operations. This is opposed to the business consultant, who is more outwardly looking to the commercial aspects of the organization and what that means for the structure. The business analyst is looking more at not the structure of the operation, but at the solution level. 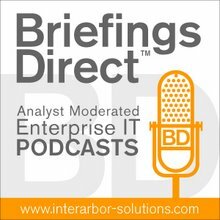 When we look at the enterprise architect and the solution architect, the business architect focuses more on the complete implications of the strategy and technology trends on the operations, whereas the enterprise architect is more interested in the IT and the implications for the IT strategy and how IT should be deployed. The business architect is much more focused on the complete performance of the business operations. So, the bottom line of these delineations of the past one-and-a-half years is that there is a reason for being for a business architect. It is a distinct role and it has a real solution for a problem. Mahakena: What we've been doing in the Business Forum, after we decided that business architecture has its own reason for existence, we described the business architecture p rofession -- what's the scope and what should be the outcome of business architecture. Now, we're working on the practice of business architecture by defining a framework, looking at methods, and defining approaches you can use to do business architecture. Parallel to that, if you know what the profession is and what the practice is, you're able to create the business architecture certification, because those things help you define the required skills and experience a business architect needs. So, we are working on that in the Business Forum. Daley: Let's look at business architecture from the concept that has existed, combining the thoughts of what Mieke and Harry have already talked about. When we work with clients, for those of us that are in consultancies, we see that there is normally something that’s similar to business architecture, but it's either a shadow organization inside a purely business unit that isn't technology focused, or it is things like the enterprise architects who are having to learn the business concepts around business architect anecdotally, so that they can be successful in their roles. I'd suggest that we're seeing a need to make it more refined and more explicit, so that we're able to identify the people that fit for this. They have specific things, instead of having general things that we have today. For me, the certification helps provide that certainty as a hiring manager or as somebody who is looking to staff an organization. It provides that kind of clarity of what they should be doing, giving them specific activities, specific things they do that create value for the company. It takes out of the behind the scenes action and pull something that's critical to success into the front with people who are specifically aligned and educated to do that. Globalization is creating more and more complexity in the business models that organizations are trying to operate within. Gardner: How does the globalization impact the importance of this role? Haviland: Globalization is creating more and more complexity in the business models that organizations are trying to operate. Over the last couple of decades, with the science and engineering of IT, there has been enormous investment by companies to actually operate, maintain, and improve their IT in their current world. In many cases, this IT work has outpaced the comparable business efforts inside those organizations, when they actually think about their business, their business models, and their business operating principles. What we're actually seeing now is that the rigor, the engineering, and the effort that’s put into technical architecture and IT architecture is now being proposed on the business side, with many business management process improvement activities. These tend to be at quite a low level, however, when you compare them to business architecture initiatives at the enterprise level. If those architecture initiatives are at the high levels that are needed, you start to consider the scope and challenges that come into play, when you start talking about globalization. So, with the increase in scope and the global way that people are operating across cultures, geographies, and languages, that requires this discipline, which does operate at that high level to start to organize the other areas, but perhaps at a lower level. Hendrickx: There are two aspects that need to be paid more attention to with globalization and more complexity. First, the business architect is, or should be, equipped to look at the organization, not only within the boundaries of an organization, but also the ecosystem of organizations that will mold together and have to be connected to produce the value. Since these are more formalized contracts or relationship with different organizations connected to each other, there is a dynamic that is hardly seen anymore, that is not transparent anymore. There clearly needs to be some more detailed insights and transparency for each organization, so that people understand what the impact of certain developments or events will be. This can't be done just by logic or just by watching carefully. This really needs some in-depth analysis for which the business architecture is built. The second part of it is that the due to the complexity, the decision making process has become more complex and there will be more stakeholders involved in the different areas of decision making. The business architect has a clear task and challenge as well. By absorbing the strategy, technology trends, and the different developments and focusing on the applications for operations, he has the opportunity to discuss with the different stakeholders. He has the opportunity to get those stakeholders either mobilized or focused on specific decisions: the deliverables you will provide. If you start talking to all those other areas in the business, then suddenly people have a completely other way of thinking. Sometimes they use the same words and don't understand each other. Gardner: We certainly see a lot of important characteristics in this role: global, strategic high level, encompassing business understanding, as well as technology. Where do you go to find these kinds of people? Who tends to make a good business architect or is there no real pattern yet established as to who steps up to the plate to be able to manage this type of a job? van Gelder: To all the complexity already mentioned, I'd want to add something else that we found in the Business Architecture Working Group, which is more research in the whole field. That's the problem of communication. How do people communicate with each other? If you look in the IT world, most people come from an engineering background. It's hard enough to talk to each other and to be clear to each other about what's possible and how you should go or what you should go for. If you start talking to all those other areas in the business, then suddenly people have a completely other way of thinking. Sometimes they use the same words and don't understand each other. It’s not easy to have these kinds of people that need very good communication skills next to all the complexity that you have to handle. On the other hand, you need an architect when it's complex. You don't need an architect when it's simple, because everybody can do it. But an architect is just a person. I say if I am a simple person, I can only handle simple things. What you need are people who can structure. I can only work with things when I can structure it, when the complexity is fairly well-structured. I then have overview of all those complexities, and then I can start communicating with all the parties I have to communicate with. At the moment, I don't see any real training or development of these kinds of people that you need. Most of them come with a lot of experience in a lot of fields, and because of that, they have the possibility to talk to all kinds of people and to bring the message. Gardner: Mieke, at Capgemini Academy, you’ve obviously encouraged and encountered folks moving towards a business architect role. What are your thoughts on what it takes and where they tend to come from? Mahakena: Let's have a look where they can come from. What you see is that this role of business architect can be a next step in one’s career. For example, a business analyst, who has been creating a lot of experience in all kinds of fields, and he could evolve to watch a business architect. This person needs to get away from the detail and move towards the strategy and a more holistic view. Another example could be an enterprise architect who already has analytics skills and communication skills. But, enterprise architects are more or less focusing on IT, so they should move more towards the business part and towards strategy and operations. One could be the business consultant who is now focusing on strategy, also should have those communication skills, and will be able to communicate with stakeholders in high positions in companies. Business consultants have a lot of industry knowledge. So they should need more knowledge about technology and perhaps improve their analytics skills and learn more to how to structure operations. There are number of existing roles that already have a lot of skills required for business architecture. They just have to enhance skills and get new skills to do this new role. So, there are number of existing roles that already have a lot of skills required for business architecture. They just have to enhance skills and get new skills to do this new role. Gardner: We talked about how this is important because of the internal organizational shifts and the need for transformation. We’ve seen how globalization makes this more important, but I’d like to also look a little bit at some of the trends and technology. We’ve seen a great deal of emphasis on cloud computing, hybrid computing, the role of mobile devices, wirelessly connected devices, sensors, and fabric of information which, of course, leads to massive data, and they need to then analyze that data. This is just a handful of some of the major technology trends. Kevin Daley, it seems to me that managing these trends and these new capabilities for organizations also undergirds and supports this need. So how do you see the technology impetus for encouraging the role of business architect? Daley: I'm seeing from my work in the field that we’ve got all these things that are converging. Certainly, you've got all these enabling technologies and things that are emerging that are making it easier to do technology types of things and speeding them up. So, as they start maturing and as organizations start consuming them, what we’re seeing is that there’s a lack of alignment. What this trend is really doing is making sure that you have something that is your controlling device that says what is the business relevancy? Are we measuring these peer-to-peer -- measuring something such as massive data and information fabrics compared to something like cloud computing, where you are dispersing the ability to access that more readily. It creates a problem in that you have to make sure that people are aligned on what they're trying to accomplish. We're seeing that the technologies that are emerging are actually enabling business architecture in a fashion. It provides that unified vision, that holism, that you can start looking at combinations of these technologies, instead of having to look at them as we’ve had to in the past of siloed elements of technologies that have their own implications. We're using business architecture as a means to provide the information back to the business analyst who is going to look and help. You can provide the business implications, but then you have to analyze what that implication means and make decisions for how much of that you’re willing to accept within your organization. In the notions around how I investigate risk, how I look at what is going to improve market, and what is the capacity of what I can do, there's a disconnect that business for which architecture is helping provide the filler for to get to the people that are doing these corporate strategies and corporate analysis at a level. That allows them to virtualize the concept of the technology, consume what it means and what that relates to for a business or in terms of its operation and strategy and the technology itself. We’re seeing this become the means by which you can have that universal understanding that these are the implications, and that those implications can now be layered, so that you can look at them in combination instead of having to deal with each technology trend as if it's a standalone piece. When you adopt technology, it obviously has a level of maturity it has to reach, but it also has a level of complexity. We're seeing this as a means by which to provide some clarity around what any adoption would be. When you adopt technology, it obviously has a level of maturity it has to reach, but it also has a level of complexity. It's being able to start taking advantage of more than just one technology trend at the same time and being able to realistically deliver that into their business model. What I have been seeing is that the technologies are driving the need for business architecture, because they need that framework to make sure that they are talking apples to apples and that they are meaning the same thing, so that we get out of the interpretation that we have had in the past and get into something that’s very tactical and very tactile, and that you can structure and align in the same way, so you understand what the full ramifications are.